The Kurdish-led Syrian Democratic Forces (SDF), with help from USA and British special forces, have made the advances over the weekend and are continuing today. ISIS said in a statement posted late Sunday that two of its "martyrdom-seekers" attacked SDF fighters in Baghouz with their explosive-laden auto. Gen. Joseph Votel, the commander of USA forces in the Middle East, estimated there are between 1,000 and 1,500 IS fighters in the small area they still control, but he said others have "dispersed" and "gone to ground". Backed by air strikes, the SDF have driven out IS from towns and villages in north-eastern Syria in recent months. Asked whether the withdrawal of America's more than 2,000 troops would begin in days or weeks, Votel said: "Probably weeks". ISIL snipers and landmines have slowed a US-backed ground force as it pushes to retake the armed group's last enclave in eastern Syria. Trump announced in December he was pulling all 2,000 USA troops out of Syria, saying the battle against Islamic State there was nearly won. That's according to a Sunday report by Martin Chulov in the Guardian, which says the secretive leader known as "Caliph Ibrahim" had to fend off a two-day internal assault in September, by foreign fighters within his group who were eager to overthrow him. All that is now left of the "caliphate" declared by ISIS in 2014 is a cluster of farmhouses and fields on a bend of the Euphrates River in northern Syria. Including things the United States says it doesn't need. It has sent vehicles into eastern Syria as well as artillery. 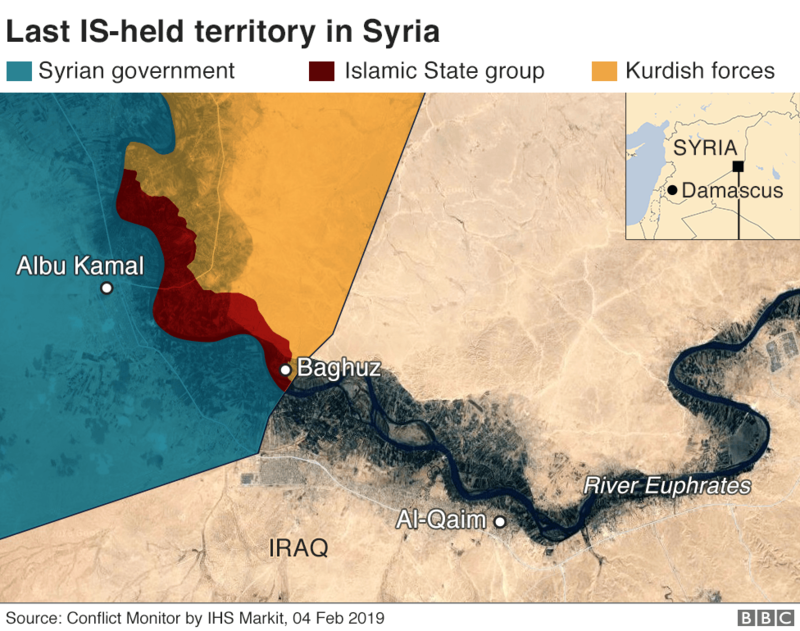 US officials have said in recent weeks that IS has lost 99.5 percent of its territory and is holding on to under 5 square kilometers (under 2 square miles), where the bulk of the fighters are concentrated in Syria.